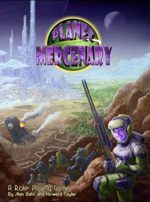 Howard Tayler, the creator of Schlock Mercenary, is now shipping the Planet Mercenary RPG. This was successfully Kickstarted in mid-2015, but if you missed the Kickstarter, you can buy a hardback here or get the PDF here. 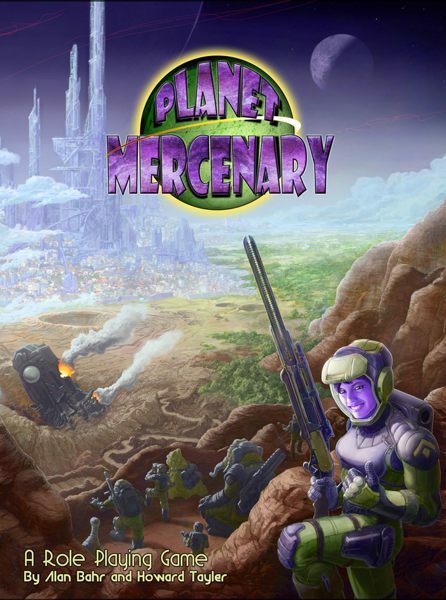 I had a marvelous time as a player in one of the mid-stage playtests of Planet Mercenary. It was refereed by Alan Bahr, who, with Howard, created the game. I played the captain of a mercenary ship, a member of the Ob'enn race. The Ob'enn have occasionally appeared in the strip, usually as antagonists (they are about as antagonistic as you can get). So I had a starting place, a main theme if you will, and I riffed shamelessly on that as I tried to get into my character's head and do what HE would have done, and not what I would have done, with his booby-trapped mission and motley crew. The captain goes by "Sir." This is because if his ancient and honorable name is properly pronounced in Ob'enn, a Galstandard West speaker will hear "Fuzzybutt." Sir is far too arrogant to use an alias, so he has simply decreed that he be referred to only as "Captain" or "Sir," even in the company's digital records. 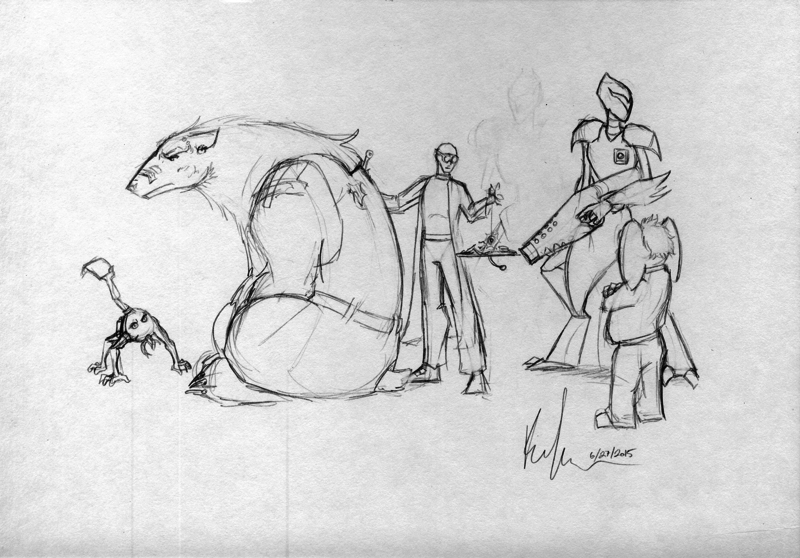 Pencil sketch of our game group, by Keliana Tayler. I'm the one on the right, with the big ears. 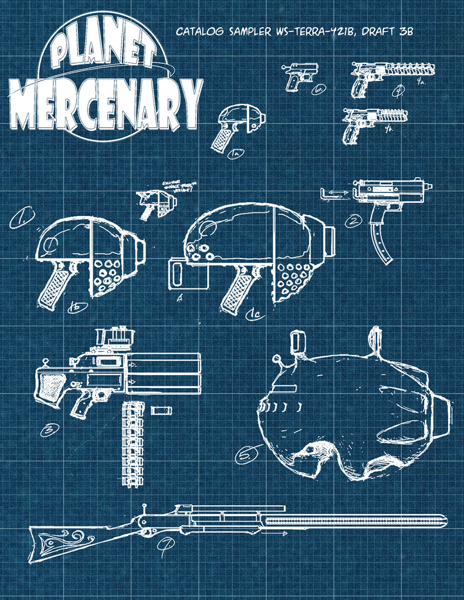 Weapon images by Ben McSweeny. Sir is no longer welcome among his people, and has no siblings left, because of a whole series of harfs by his family leaders, his immediate family, and (last and most humiliatingly) himself. He really does not want to do that again. Harfing killed everybody he cared about. He can just feel his ears shrinking every time he listens seriously to an underling, but he takes his [untranslatable] ego in hand and does it anyway. Usually. He knows he'll harf again, but not today. 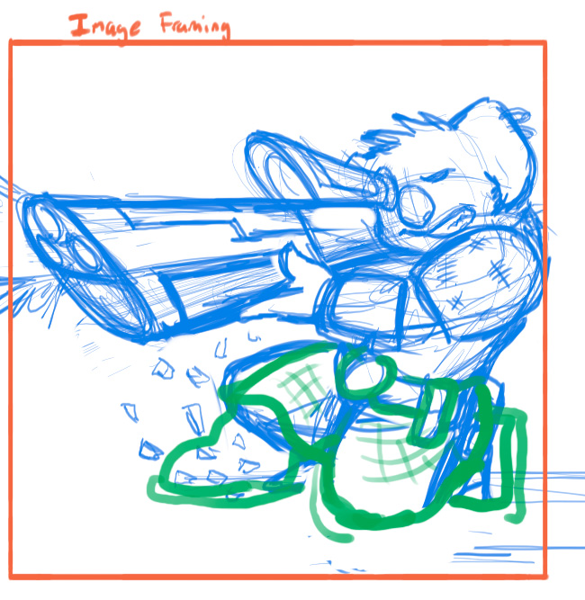 Sir collects sniper jokes - the mean kind, like "Don't run. You'll only die tired." (Oddly, that one has been verified, so far, as originating independently in 46 different cultures.) He is fond of quoting The Seventy Maxims, and also misquotes it in rhyme, which is as low-humor for Ob'enn as punning is for an Earthling. Pencil with colors added – pre-render art by Matt Franklin. The green lines are Howard's direction for tweaking the legs. Sir's species look like cute little koala bears. They are very definitely not. But that's how they look. And Sir, who read a lot of science fiction when he was growing up, secretly views ursumari, the uplifted Terran polar bears, as some kind of super-dangerous, future-evolved, scary-fascinating-ogreish Ob'enn. Fortunately, they have ridiculously tiny ears, or he probably would not be emotionally able to command ursumari troops! As is, he gives his ursumari engineer even more slack than her size and bad temper should call for. A 21st-century human would say, "He thinks she's She-Hulk." Sir prefers that his opponents show their submission by falling down and bleeding out, but for enough money, he will cheerfully take prisoners. All art is copyright by The Tayler Corporation and used by permission.